Do you remember when I decided to rip out the wall in our entryway closet during the summer? 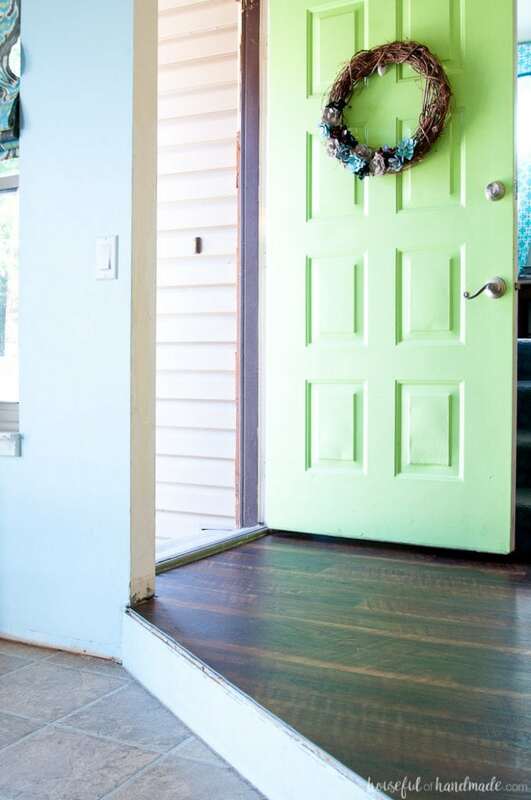 It was one of those crazy days when I really just needed to take a hammer to something and our ugly entryway was just bugging me too much so it had to go. Well, I don’t know if I made it better or worse, cause we have been living with a half finished entry, until now. This month I am working hard on getting the entry finished and the first step was learning how to install laminate flooring. This post was in partnership with DIYZ, however, all opinions and reviews are 100% honest and my own. Click here to read my full disclosure policy. I had originally thought I would just live with the old linoleum flooring until we finished the kitchen remodel. 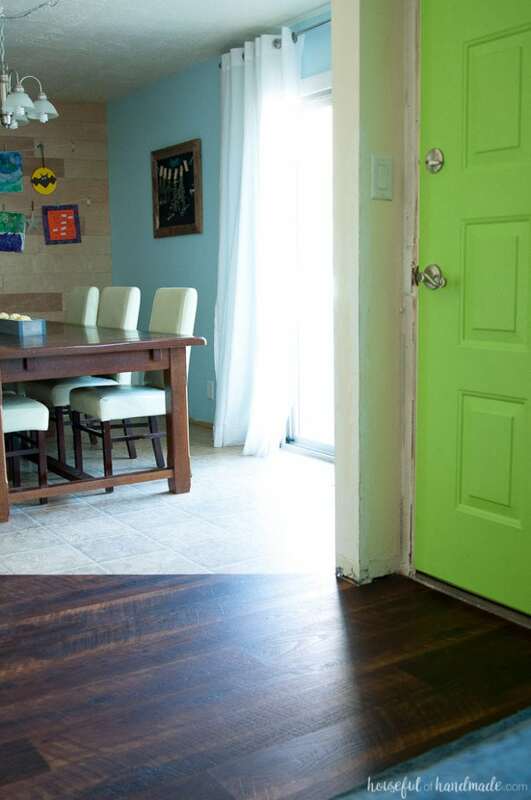 Then we would use the same flooring from the kitchen in the entryway. 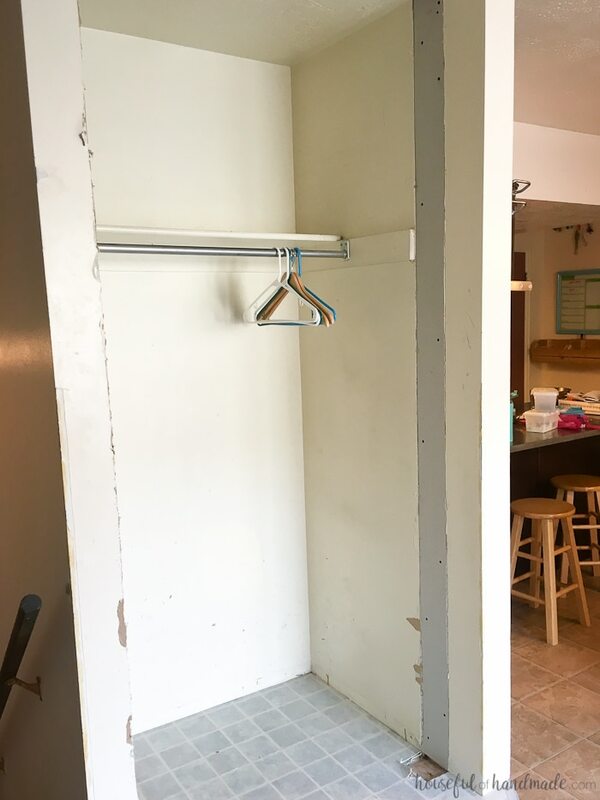 But after tearing out the wall, I was left with two gaping holes in the side of the closet where we had no flooring at all. This was not going to work for me. 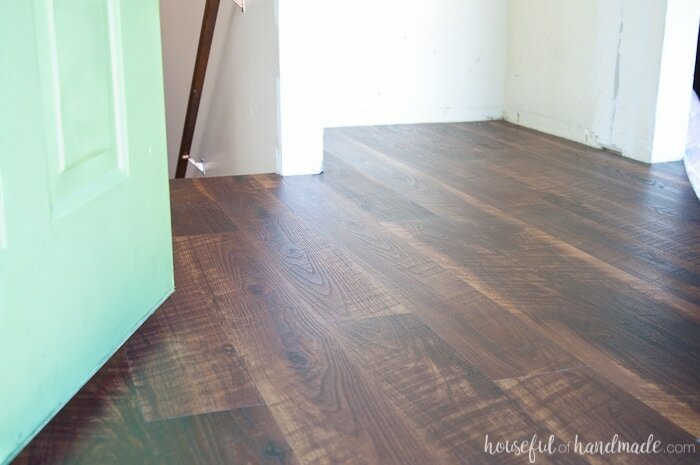 So when my mom installed this beautiful vinyl laminate flooring in her kitchen that looked like worn hickory, I knew I wanted it for our entryway. 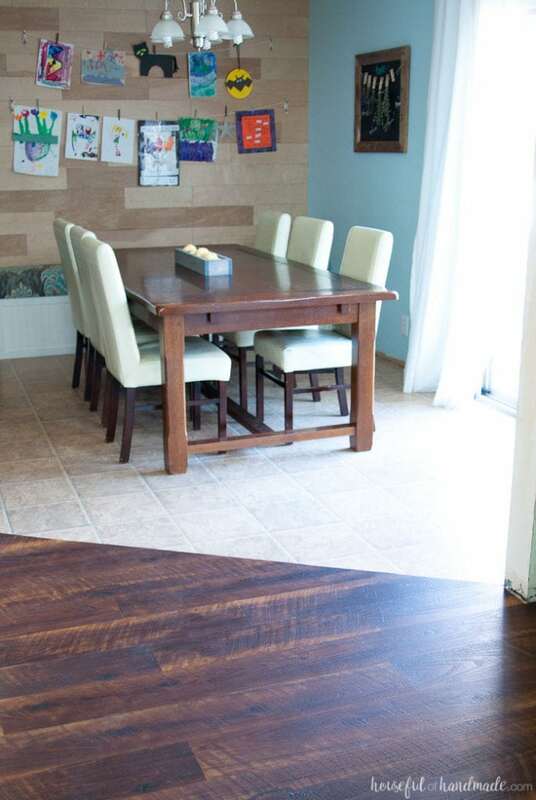 And bonus, the vinyl laminate is good to use in areas that have water, unlike regular wood laminate flooring. 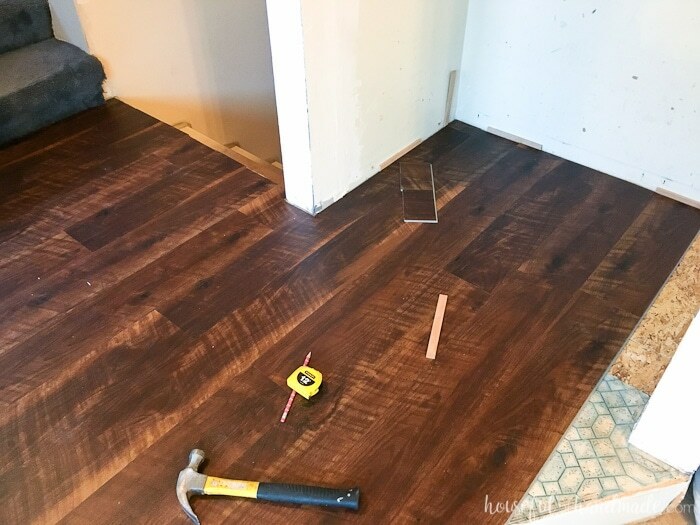 So now I had my flooring, but there was one big problem… I had no clue how to install laminate flooring! Lucky for me, I had the DIYZ app. This app is so easy to use. 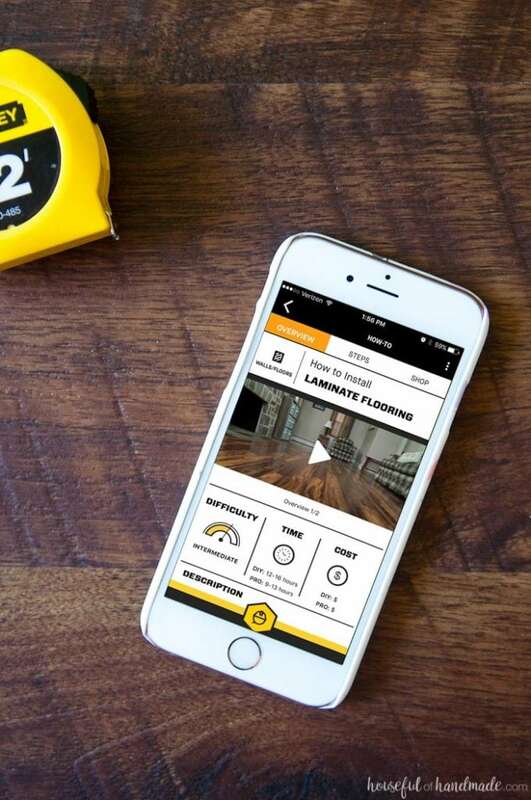 It is full of tutorials for you to be able to tackle any DIY project in your home with confidence. It has everything from electrical to plumbing, from ceiling to floors. 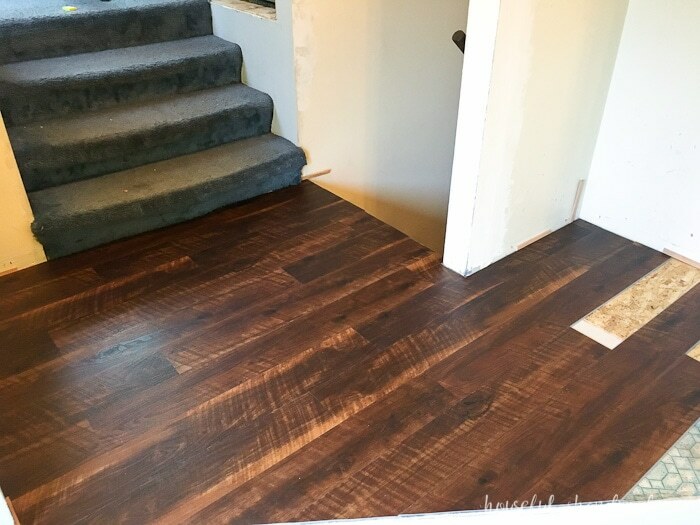 And of course, a step-by-step tutorial for how to install laminate flooring. Download the app in iTunes or Google Play. Then start searching for DIY projects you want to do. Once you find your project, the first thing you will notice is there is a complete tools and materials list. You can even order everything you need online and then have it delivered to your door! I started gathering everything we would need for our new entryway floor installation. One things I already knew, but forgot until the day before I wanted to install, was to bring the flooring in 48 hours before install. Thankfully the DIYZ app made sure to include the basics as well as the harder stuff, so I had to put off install day by 1 day so that my floor was acclimated properly. According to the DIYZ app, this project would take 12-16 hours. Since we were working on a 80 square foot landing instead of a full room, we planned one day and were able to get it done in under 8 hours. This included the demo. 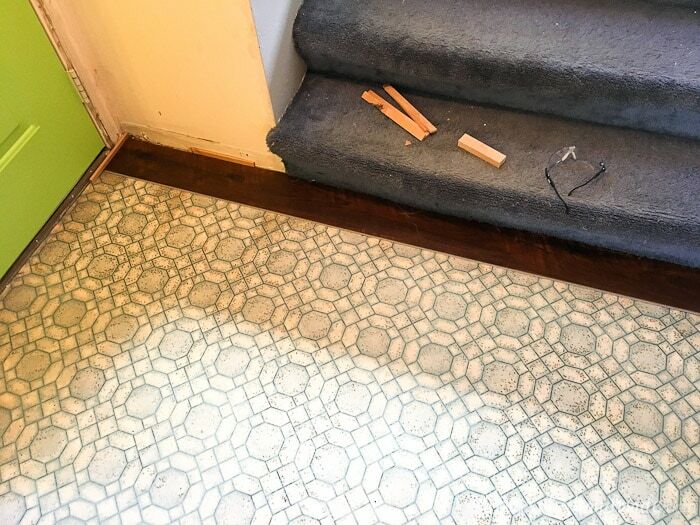 We started by removing the baseboards, then we discovered there were multiple layers of subfloor/linoleum on our entryway so we removed one of them before installing too. We also had to patch the subfloor that was in the closet because there was not a layer of it where the wall we removed was. The first row of the laminate flooring installation is the hardest. 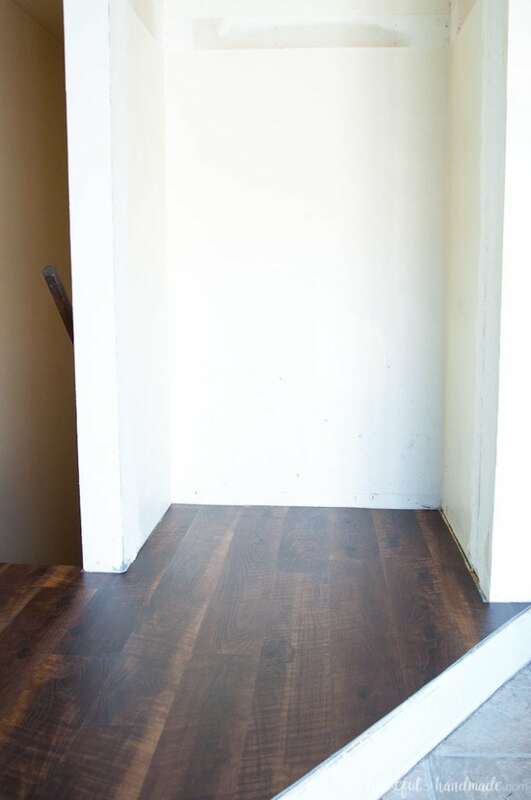 You have to cut the flooring to fit into any nooks and crannies your room might have. Also, the flooring moves around a bit until you get the first two rows together. The DIYZ app comes complete with step-by-step and video tutorials so that these more challenging steps were actually pretty easy. I wouldn’t have been so fast at getting things going without it. After the first two rows are in, things snapped together pretty quickly! Since I was working on a smaller space, I did have a bit more cutting. In a large room the center area would just snap together so quickly with those large boards of laminate. After just an hour, I could see the impact that the new floor was making on our entryway! The old ugly linoleum was almost gone and the new floor was a much better fit for our home. Installing the last row of flooring was so exciting. And because of the video tutorial in the app, it was so easy. They show you how to easily scribe the board for proper cutting to fit into the edge of the room. And without the video I probably would have been lost, but seeing what they were talking about made it super easy. I was able to get the flooring all installed and then make it to a family dinner in the evening. Now that the flooring is done, I can finish the rest of the entryway makeover! I am going to be adding a wall treatment to the new nook, add shelves, a cupboard, a bench, hooks, etc. All the stuff that will make it easier to keep our family more organized. Basically it is going to be our mudroom since we don’t have an actual mudroom. I couldn’t be happier with the progress we have made so far. Thanks to the easy to use DIYZ app, I know I will be able to tackle some of the other projects I was a little unsure about (like installing the sinks and faucets in our master bathroom now that we have the vanity top in place). Someday our fixer upper will be all done, but until then I am going to go take on another project. So if you have any projects you need a little guidance on, you’ll definitely want to try out the DIYZ app. Without it, this project definitely wouldn’t have went so smoothly. And now I am thinking of using the same type of flooring for our kitchen when we remodel it. Thanks so much for answering my email. And thank you for your DIY. You are very welcome Cherl. I hope it helped give you some good (and budget friendly) ideas!